I made it to OKC after getting a later start for the airport than planned, and running into bumper to traffic on the freeway. It sucked. We got to the airport with enough time to get through security, hit the restroom, walk to the gate, and sit down for about five minutes. That’s little more rushed than I like to be, but it all worked out. I used an epass on my iPhone to get through security and to board, and it was so much faster than a paper ticket that I was shocked. Totally cool! I sat across the aisle from Zoe on the plane, the flight was so short that I had enough time to read my Yen Plus magazine and a couple of chapters from Sense and Sensibility and Seamonsters. It was an uneventful flight on a tiny little plane, where everyone standing up bashed their heads on the overhead bin compartments. Ouch! I didn’t do it, but I felt bad for everyone who did. Especially the lady two rows up who did it twice! Laurie rented a car, and it wasn’t long after we landed that we were headed for the fairgrounds. It’s only a short drive from the airport, and once we arrived at the fairgrounds, we had to find out where everyone was. We are in Barn 4, and they did a great job decorating. I will post pictures later - I haven’t had a chance to shoot any yet. I can’t believe how hectic it’s been since we got here! We missed Amber’s class, but she placed 2nd in the 10 – 11 Walk/Trot Eq class on Peanut. I rode Nyk in the performance ring so we would have a feel for what it was like. Gizmo and Kongo went last night, so we watched the evening session and saw some beautiful stallions. Wish I had about a 100k so I could have a horse that pretty! Maybe in my next lifetime. Gizmo was third in his class. I was exhausted by the time the session ended, and all I wanted to do was go to bed. There was talk about going out to dinner, but I just couldn’t do it. I would have fallen aside with my face planted in my dinner plate. Instead, a couple of us did some power shopping at the grocery store so there would be breakfast food. The RV was empty of supplies. Since I was in the first class, and the food court didn’t open until 9, which was when the show started, I was a little freaked out about getting something to eat before I rode. I didn’t sleep very well, and 6:30 arrived way too fast. Audie’s class was right after mine, so we both got ready and headed down to the barn. Did I mention that it is freezing here? It is colder than it is in Detroit, and since it is so flat, there is a biting wind that just cuts to the bone. Brrrrr. So cold!!!! Our first class was a blast, but we didn’t place. There were 16 horses in it, which is the biggest class I have shown in. I got caught up in some traffic on the first trot, but we went so long that I was able to get out of the crowd and on the rail by myself. Nyk was very mannerly, but I couldn’t get him up of his bridle and he would not use his ears. M said that that really hurt us. It is so frustrating that he won’t use them at all. He walked, trotted, and cantered the best ever, but it didn’t count for crap because he had his ears twisted around on the back of his head. Audie rode Leela, and she finished 6 out of 12. One of the horses in her class flipped over backward and landed on his rider – both were fine and got back up and finished the class. I hate seeing stuff like that and was happy no one was hurt. After hitting a few of the shops that are selling horse stuff, we went to Toby Keith’s for lunch. It was ok – not a favorite, but not the worst. The mashed potatoes were wonderful, and the service was great, too. We hit some touristy places on the back back to the fairgrounds. 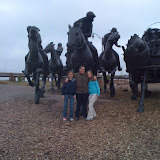 We saw some statues of horses and after investigating, discovered that it was a monument to the land rush, and then went downtown to see the memorial for the OKC bombings. They did a great job with that, and I wished that I had thought to bring my real camera, instead of having to rely on my iPhone. Now I am chilling out, feeling a little tired from a whirlwind day. I have a driving class tomorrow morning. I really hope my little pony cheers up and uses his ears!